Fresh cranberries are one of nature’s most versatile fruits, and one of my favorite berries. If you just think they come served whole in a can only at Thanksgiving, let me open up a whole new world for you. Cranberries are pucker-up-your-mouth tart when eaten raw, are perfect cocktail add-ins for champagne (they float adorably), and are ideal for baking. If you want a little background on them, please refer back to my semi-drunk lesson on them in The Champagne Way, episode 23. 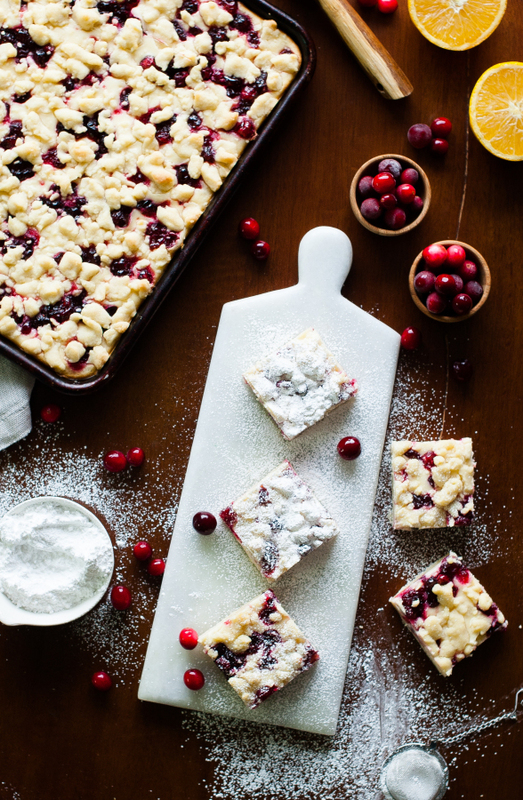 For today’s purposes, we’re making DOUBLE boozy cranberry cheesecake shortbread bars. There’s not too much alcohol in here (more for you to drink while baking), but enough to add depth and flavor. 1. Preheat the oven to 350 degrees. Line a 9x13" baking dish with parchment paper(for easy removal of bars for slicing. 2. Place softened butter, flour, and powdered sugar in the bowl of a stand mixer and mix together with a paddle attachment until just combined. Reserve ⅓ of the dough and press the other ⅔ into the bottom of a 9x13" baking dish. Smooth out dough as best you can, but don’t press too thin. 3. Bake the dough in the preheated oven for 10 minutes. Remove and set aside while you make the cheesecake filling. 4. In a mixing bowl, beat together the cream cheese and sugar until smooth. Add the egg, Greek yogurt, orange extract, champagne, and vanilla and beat together until smooth, scraping down the sides as necessary. Set aside. 5. In a saucepan, combine the water, orange juice, Grand Marnier, and 1 C. sugar. Bring to a boil over medium/high heat, stirring to dissolve the sugar. Rinse the cranberries and discard any that are not up to par. Add cranberries to the boiling syrup and reduce heat to a simmer. 6. Let simmer for 10 minutes, or until the cranberries have mostly burst and sauce has thickened. 7. Pour the cheesecake topping over the par-baked crust. Then, using a spoon, drop cranberries and sauce evenly over the cheesecake. Crumble the remaining shortbread crust over the top of the cheesecake and berries. 8. Bake for 25-30 minutes, or until the cheesecake is puffed up slightly and the crumble is golden on top. 9. Remove and let cool. Chill for 2-3 hours. 10. Dust lightly with powdered sugar and cut into bars. Buy a big enough bottle of champagne to try this cocktail out: Reserve a few spoonfuls of cranberries/cranberry syrup mix and let cool completely (pop in the fridge if need be). In a cocktail shaker, mix 1 ½ shots of vodka, the reserved syrup, and 1 tsp of lime juice. Pour in glass, and top with champagne.